Last weekend I had the most wonderful baby shower, surrounded by 17 incredible women supporting me and celebrating us and this baby. I really felt showered with love!! And, two of my friends threw the shower together and did an amazing job. There were mood boards, custom graphic design by Jenni, even some updates to Jessie's house (she had been meaning to paint her dining and living rooms but did it before the shower!)... and, we had the most beautiful sunny day so had the doors wide open with fresh air and lots of light. It was all around just a magical day! Jenni and Jessie worked so hard on this shower and making it perfect for my style. I have to share! 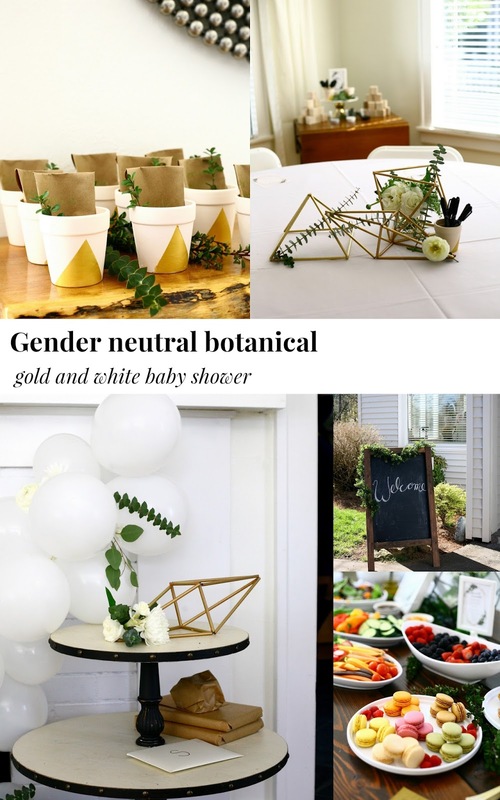 We actually do know baby's gender, but I wanted to keep it neutral because my style is much more white and natural elements than it is blue or pink anyway! Jenni is great at arranging flowers, and Jessie made the gold shapes out of paper straws and spray paint. There were pens and advice cards on the table for everyone to share their parenting advice with me. Got some really special comments from friends!! I read them aloud (I didn't share the names aloud) before opening gifts. There was only one other game/activity--decorating 26 wooden blocks with letter stencils, paint, and pens. The food was so lovely. The party was at 2pm so it wasn't a meal, just beautiful fresh fruit and veggies and a huge selection of gluten-free desserts. The party favors were seed packets, spinach, heirloom lettuce, etc. in little plant pots Jenni and Jessie made. And the "guest book" was this special children's book! Now we have kind messages from my friends in it forever! Also, white balloon garland!! Love it! I wore this dress which I bought back in cold, rainy January--it was so perfect that it was almost 70 degrees and sunny on the day of my shower! The bump is getting very big! I am so touched by the energy my friends put into this shower, and by all of the friends and family who made the trip and shared their wisdom and gifts with us. I have been feeling a little anxious about not being ready but not so anymore! !